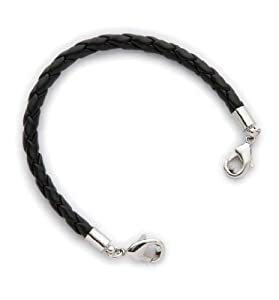 Medical Id Black Leather Bolo Replacement Bracelet - 8.5"
Product prices and availability are accurate as of 2019-04-21 04:14:01 BST and are subject to change. Any price and availability information displayed on http://www.amazon.com/ at the time of purchase will apply to the purchase of this product. Black Leather Bolo Replacement Medical ID Bracelet. Measures approximately 7 inches and a total length of 8.5" inches when our 1.5" ID tag is attached. (other tag lengths may vary) ID tags are sold separately. Clasps are made of Stainless steel. *This is fashion Jewelry and is not intended for use in Sleep, showers, pools, oceans, or hot tubs. Do Not immerse this in water.